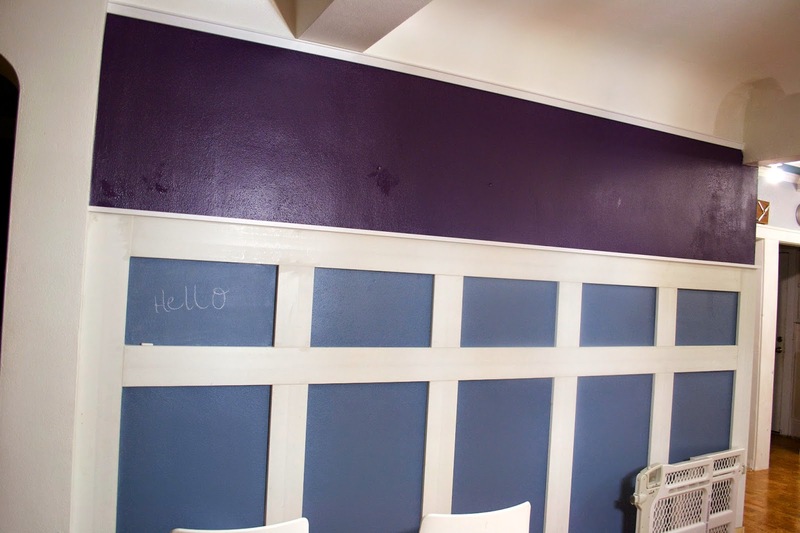 While we really liked the idea of the chalkboard paint, the blue with the purple just didn't sit right with me. It just wasn't what I was picturing when we decided to do the board and batten. 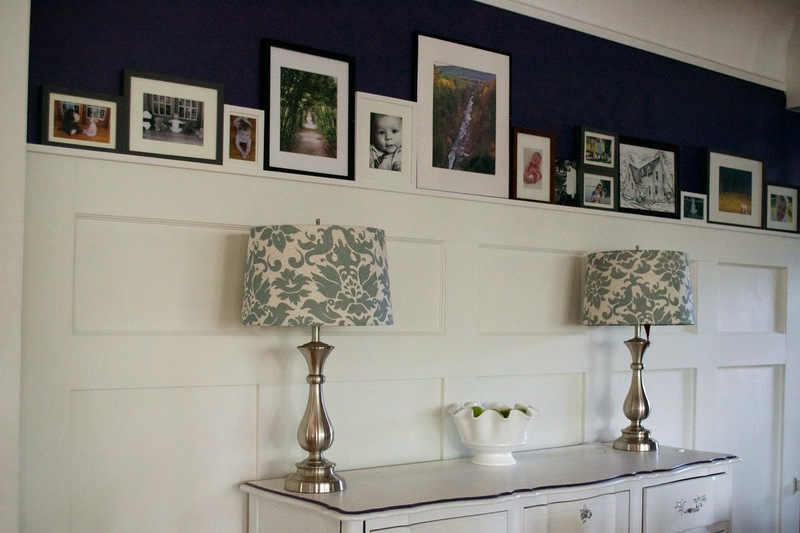 I also didn't love how blunt the squares were and wanted to match the rest of the trim in our house a little more. Since I wasn't in love with the current state of the wall, it has taken the last two months to get it to the point that I'm really happy with it. 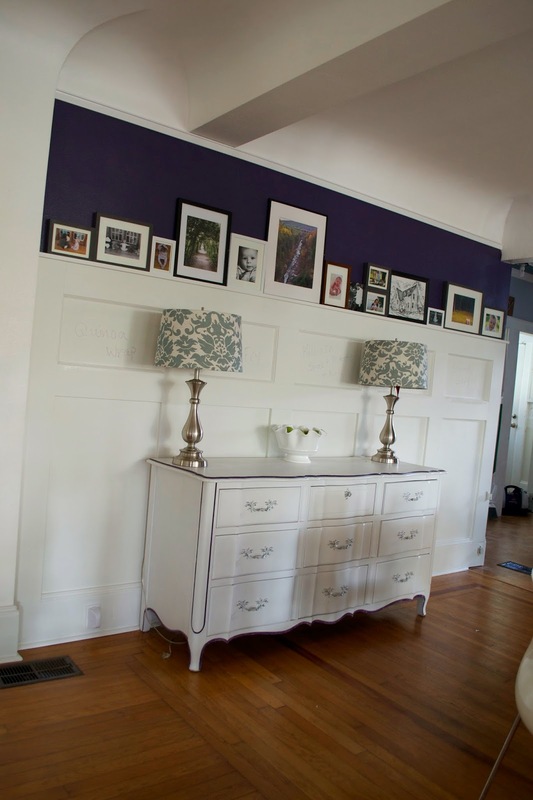 The evolution started with me finding out that Benjamin Moore will make chalkboard paint in any color you want. 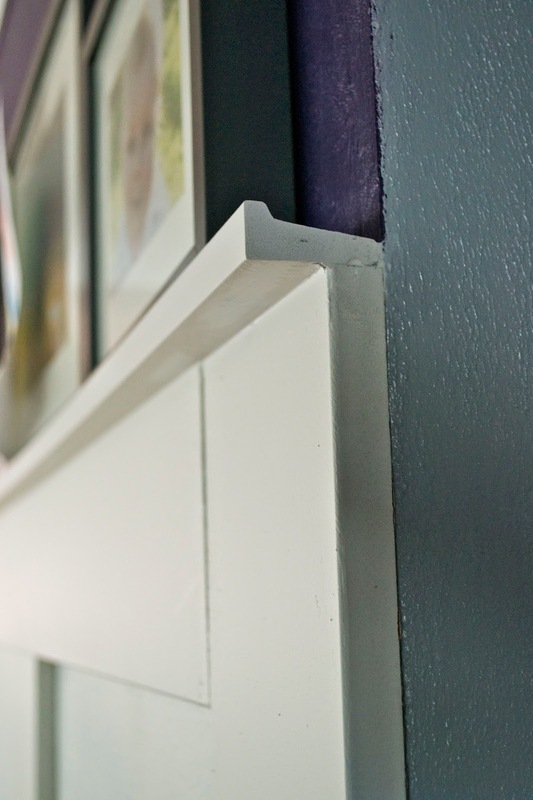 I hunted down a Benjamin Moore retailer and brought them a swatch of our trim paint color and 10 minutes later I had chalkboard paint that was a perfect match to the rest of our trim (Valspar Summer Gray). Per the advice of the paint guys, I didn't even bother priming the blue chalkboard paint. 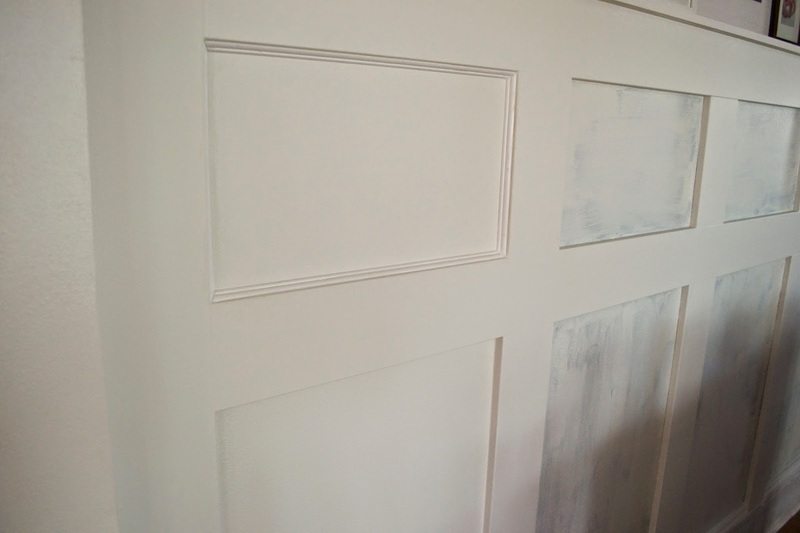 Below left is two coats over the blue and to the right is one coat. I was pretty impressed with the coverage although I did put 3 coats up just to avoid bleed through (just in case). In the above pic you can also see that we also decided to trim out the upper boxes. Since we already trimmed out the bottoms of the lower boxes we're leaving the other three sides as they are for now to see if trimming the top is enough. Along the top of the board and batten we used the ceiling trim on its back to create a picture ledge. 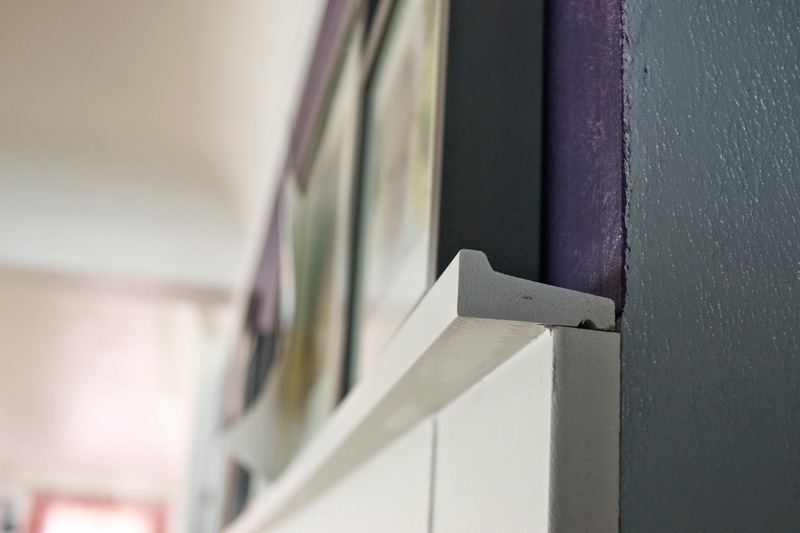 After a little caulk, it blended right in with the board and batten and is the perfect spacing for a thick Ikea frame. So after a lot more trimming, caulking and painting, we had white board and batten along with a pretty sweet picture rail. But we weren't done quite yet. Since we were using white chalkboard paint, it was super important that we primed it with white chalk before we used any color chalk on it so it would erase easily. So, I went through a bunch of pieces of white chalk, rubbing each square down and then I went over each one with an eraser to make sure the whole square was covered. Then we were all set! We have five upper squares which we are using to plan out our weekly menu. 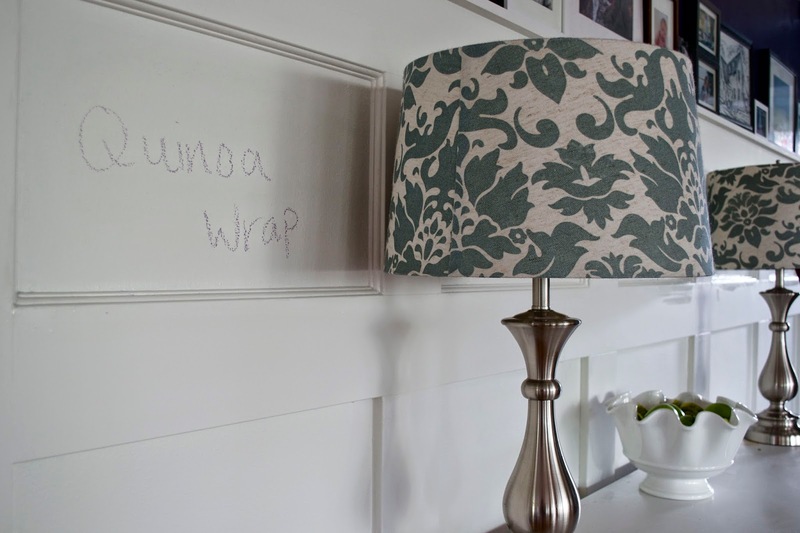 It works so well to keep us both on track and if we don't want it to look like a chalkboard we just erase everything and we have regular board and batten! It's so hard when we get halfway (or all the way) finished with a project and we don't like something, but it's so satisfying to fix it and really love the results! Great job! 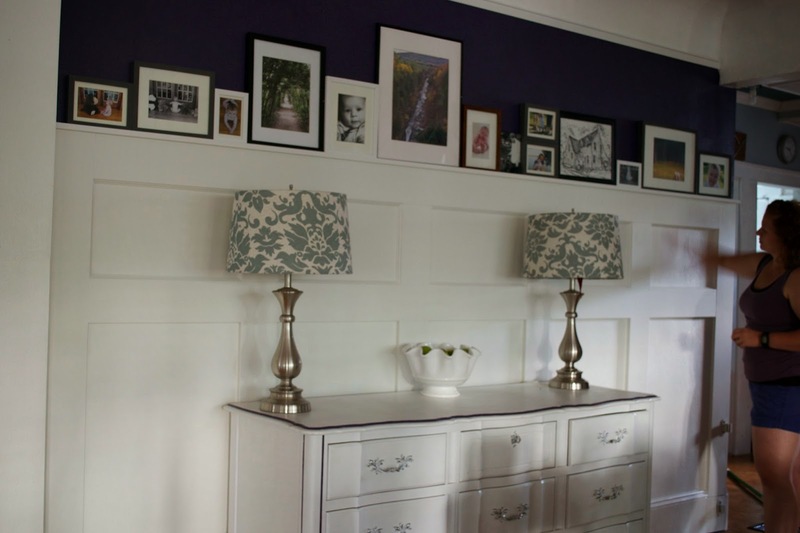 I love the combination of the lampshades against the white wall, and the paint color above the board and batten! Thanks! I actually just pulled the lamps from our bedroom and they look so much better here!